County Attorney Allen Grocholski, Commissioner Joe Acker and Commissioner Barry Corkren are shown at the Aug. 13 meeting of the Fayette County Commission. 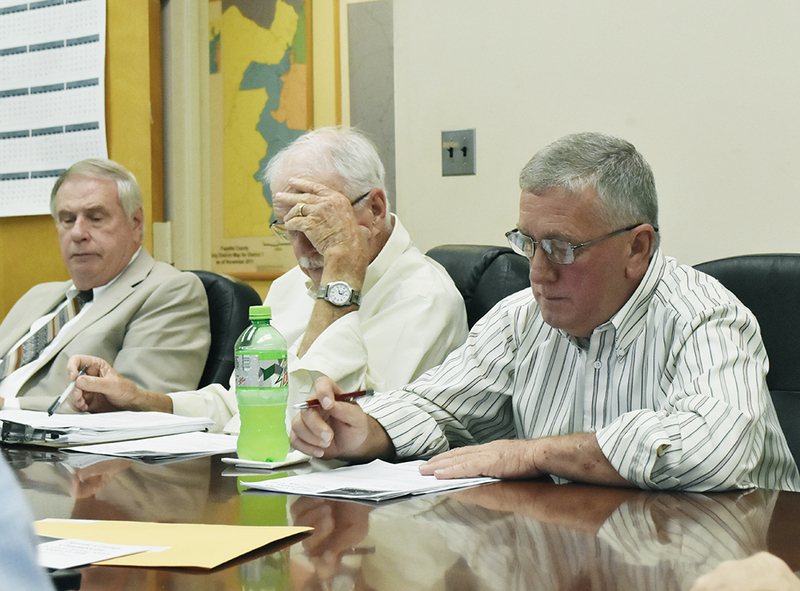 The Fayette County Commission hired a new engineer and shop supervisor during its regularly scheduled Aug. 13 meeting. Current County Engineer Luke Porter resigned his position at the last commission meeting, with his resignation becoming effective on Aug. 31. At the time of his resignation, Porter told the commissioners that Mike Tomlin had also expressed an interest in returning to the shop and resigning his position as road supervisor. The commissioners accepted the resignations and posted each position during the same meeting. After a brief executive session during the most recent Aug. 13 meeting, Commissioner John Underwood made a motion to hire Christopher Howell as the new county engineer. Commissioner Billy Rodgers seconded the motion, and the motion was accepted unanimously by the commissioners in attendance, with Commissioner James Knight being absent from the meeting.